Starting today – on January 27, 2011 – Saturn will begin to go in a retrograde or westward direction in front of the constellation Virgo. That is a signal that the best time to see Saturn in 2011 has begun. The planet Saturn – a golden world that appears to shine steadily on the sky’s dome – is rising in the east around 11 p.m. now. Saturn climbs upward through the night and soars to its highest point in the southern sky around 5 a.m. The beginning of retrograde motion means that Saturn will be rising earlier each evening with each passing day. It will soon be in a more convenient place for evening viewing. Some four-and-a-half months from now – on June 14, 2011 – Saturn’s retrograde motion will end. Then Saturn will still be visible, but its time of best viewing for the year will be over. In other words, after June, Saturn’s maximum brightness for the year will be past. It will still be visible, but it will see to have lost some luster. What is happening here? Generally, Saturn appears to travel eastward in front of the background stars. 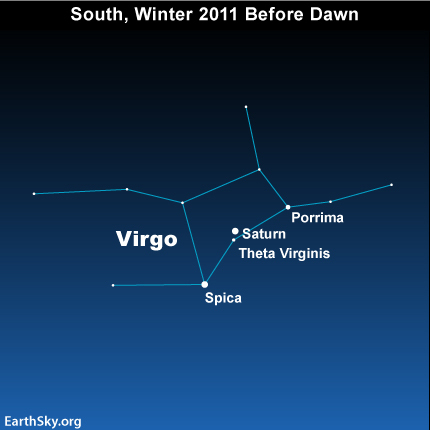 However, you will not see Saturn moving eastward in front of Virgo again until after mid-June 2011. Even the early stargazers did not imagine that Saturn literally changed direction. In fact, if you think in terms of Saturn’s orbit around the sun, you might enjoy knowing that Saturn always travels in an eastward direction in orbit. Our Earth in its smaller, faster orbit around the sun is now in the process of passing between Saturn and the sun. We will pass between Saturn and the sun on April 3, 2011. Saturn is the sixth planet outward from the sun and moves more slowly than we do in orbit. Saturn now appears to be moving in retrograde – opposite its usual eastward motion – because our planet Earth, like a fast racing car, is now zooming by Saturn from the inside track. It is like when you are in a fast car on the highway and you pass a slower car, it can seem to be moving backwards? That is the case here. As seen from Earth, Saturn will look like it is moving westward through the stars – even though it really is not. Isn’t nature cool? If you want, you can track Saturn’s upcoming retrograde for yourself. Notice Saturn’s present position relative to Theta Virginis, the faint 4th-magnitude star. If you cannot see this star with the unaided eye, use binoculars. They are only about 1.5 degrees apart (the width of your little finger, if you it hold it an arm length away). Now see if you locate and the brighter 3rd-magnitude star Porrima, named for a Roman goddess of prophecy. If my ‘prophecy’ holds true, you will see Saturn a scant one-quarter degree from Porrima at the end of Saturn’s retrograde in mid-June. Therefore, the best time in 2011 to see Saturn has begun. Check out this year’s how-to-see Saturn post if you are not sure how to find it. Or look for Saturn on the night when it will be near the moon. With its retrograde motion beginning today, Saturn will be at its best for about the next four months of 2011.